As you surely know, the Mets have filed an appeal to have B.J. Upton's infield hit last night scored as an error on David Wright. Doing so, of course, would mean that what had previously been a masterful Dickey one-hitter would become a masterful Dickey no-hitter. We've watched the replay of the hit dozens of times since last night, and we still don't know if we agree with the scoring decision or not. At first glance, we want to say it should have been an error — the ball isn't hit that slowly to third — but when you factor in Upton's speed, it's understandable why Wright felt he had to barehand it, thus making it a much more difficult play. In any case, Terry Collins expects to get an answer tomorrow, even though he doesn't really expect that the official scorer's original decision will be be overturned. 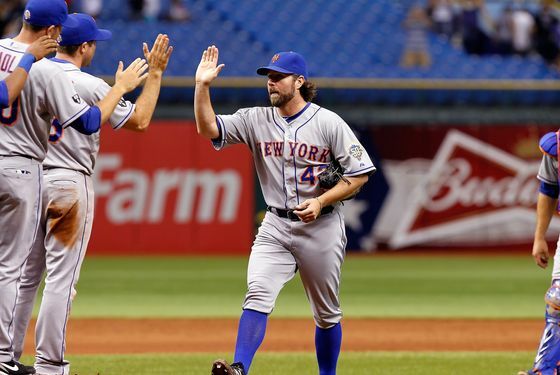 As for Dickey, according to the News, he "didn't sound 100% happy that the Mets made the appeal." He said today that earning the no-hitter after an appeal would feel "cheap" and noted that he didn't have to pitch the later innings with the pressure he'd have felt if there were no hits on the scoreboard. Explained Dickey: "I think the asterisk beside the no-hitter would get more attention than the no-hitter, you know?" And so, on the off chance the Mets win their appeal and Dickey is credited with a no-hitter, all of the columnists who'd inevitably line up to paste an asterisk onto his accomplishment can now save themselves the trouble. Dickey's already made all the relevant points himself. Joe Torre, MLB's executive vice-president of on-field operations, said that he hopes to have a ruling before the weekend. And though he often makes these kind of decisions on his own, this time he'll get input from "several other people," including Tony La Russa. Explained Torre: "Even though I've made these decisions on official scoring on a daily basis, obviously, with what's at stake here, I just want to make sure we give the decision every opportunity to get more than just my opinion on what I've seen."